Dale Earnhardt, veteran of 676 NASCAR races, died from massive head and neck injuries after his Richard Childress Racing Chevrolet Monte Carlo impacted heavily into the turn 4 wall on the final lap of the 2001 Daytona 500 whilst dicing for third place. The impact caused a basalar skull fracture, and death was instantaneous. Dale Earnhardt was one of the giants of motor racing. His NASCAR career spanned over 25 years, and included 76 wins and seven Winston Cup NASCAR championships. 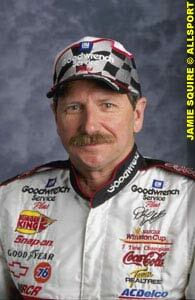 He was known as 'The Intimidator' for his on track toughness and aggressiveness. His career statistics rank second only to 'King' Richard Petty. He was NASCAR's biggest and most popular name, and one of America's most well known sports stars. His loss will be deeply felt at Richard Childress Racing, at Dale Earnhardt Incorporated, by his long time sponsor Goodwrench, by Chevrolet, by NASCAR, by his family and his legion of fans. America's greatest race has been run and won. It was one of the all time great races in the long history of the Daytona 500, with 49 lead changes, 14 leaders, finishing with Michael Waltrip taking his debut NASCAR victory at his 463rd attempt. Second was his Dale Earnhardt Incorpated Chevrolet Monte Carlo teammate, Dale Earnhardt Jr. Third was an excellent comeback drive by Ford's Rusty Wallace after losing a lap early in the race. The breathtaking closeness of the race was offset by the last lap death of NASCAR legend Dale Earnhardt and an 18 car pile up with less than 30 laps to go. Changes to aerodynamic regulations for 'restrictor plate' circuits such as Daytona and Talledega were designed to bunch up the field, and that it did, with the cars running two and three abreast for almost the whole race. Bill Elliott led the early running, but the first lead change occurred on lap three as Dale Earnhardt Jr took over the lead. Sterling Marlin (Dodge), Jerry Nadeau (Chevrolet), Ward Burton (Dodge), Dale Earnhardt (Chevrolet), Mike Skinner (Chevrolet) and Casey Atwood (Dodge) were some of the race leaders before the first pit stops. Jeff Burton (Ford) hit the wall on lap, 47 bringing one of the races three cautions periods, causing the entire field to head for the pits. Mike Skinner led approaching the second round of pitstops but most of the field was still bunched together on the lead lap. Skinner would retire after a driveline failure during the third round of pitstops, which like the second, was completed under green flag conditions. On lap 176, Tony Stewart (Pontiac) got sideways in the closely bunched pack of cars exiting Turn 2. After some accidental contact, Stewart got airborne and rolled over the top of Robby Gordon (Chevrolet) down the back straight. The tightly packed field following bounced off each other as they unsuccessfully tried to avoid each other, many sliding across the back straight infield. Stewart was hospitalised immediately after the crash, but was released after only suffering concussion. At least 18 cars were involved and the race was red flagged. 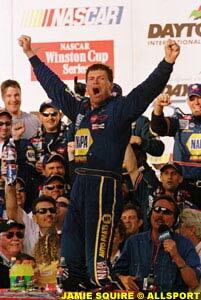 At the restart, Dale Earnhardt Jr led initially but lost the lead to Michael Waltrip with 17 laps to go. Waltrip then raced down the remaining laps with Earnhardt Jr riding shotgun while a densely packed group led by Dale Earnhardt followed which included Sterling Marlin who along with Ward Burton (eliminated in the Stewart pile-up) had been the fastest cars in the race. Coming through turns 3 and 4 on the final lap, Marlin and Earnhardt made slight contact, upsetting Earnhardt's Chevy Monte Carlo, sending him initially down to the track's apron before turning upwards into the wall collecting Kenny Schrader (Pontiac) as he went. Waltrip gave immediate credit of the win to his DEI teammate. "As soon as I can find Dale Jr., I'm gonna give him a kiss. You can't win this today without help and he was it." Waltrip also thanked his team owner, Dale Earnhardt, who had seemingly rescued Waltrip's career when he asked the winless veteran to join the DEI team. The battle for third was resolved in the favour of Rusty Wallace (Ford Taurus) ahead of Ricky Rudd (Ford Taurus) and pole sitter Bill Elliot (Dodge Intrepid). Traditional early starters, the rallyists have two World Championship rounds already completed, taking advantage of the winter months to get in some snow rallying. With the Monte Carlo Rally and Rally Sweden having been completed, three drivers sit on ten points: former multiple world champions Mitsubishi's Tommi Makinen and Ford's Carlos Sainz, and Peugeot's young star Harri Rovanpera. Fourth are Ford's veteran Frenchman Francois Delecour and one-off Mitsubishi competitor Swede Thomas Radstrom on six points. Privateer Peugeot runner Finn Toni Gardemeister is next on five points. The Monte saw a return to the winner's circle for four times world champion Makinen. 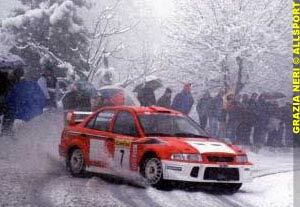 Makinen put a disappointing season 2000 behind him with a strong performance throughout to win his third consecutive Monte. Makinen took the lead after problems with the electronic throttle in Colin McRae's Ford Focus sidelined the exciting Scot. It was not all bad news for Ford, with Carlos Sainz and Francois Delecour finishing second and third, with Focuses taking seven out of fourteen stage wins. Arguably the stars of the rally were the Skoda Octavias. Long the easy beats of the WRC runners, Armin Schwarz finished a highly competitive fourth with Bruno Thiry just out of the points behind Mitsubishi's Freddy Loix. The non-factory Grifone Peugeot 206 of former SEAT driver Toni Gardemeister was the other pointscorer in fifth. The factory Peugeots had a horror run at the Monte with reigning world champion Marcus Gronholm suffering water pump failure and Gilles Panizzi and Didier Auriol crashing out, eliminating the team on the first day. The Panizzi brothers were lucky to escape serious injury after their 206 fell 40 metres from the road. Subaru were scarcely better with Richard Burns and Markko Martin each succumbing to engine dramas, with Martin not even starting SS1, and Petter Solberg crashed. Peugeot reversed their troubles by claiming Rally Sweden. Only Scandinavians have ever won Rally Sweden, and this year was no different with Harri Rovanpera making his debut World Rally Championship victory in a Peugeot 206. Rovanpera was leading after the second day and survived a challenge from Tommi Makinen to win. For Tommi, it all ended in tears when he rolled his Lancer on the last stage. Mitsubishi Ralliart salvaged a good result however with local driver Thomas Radstrom bringing his Lancer home second. The strength of Ford looked ominous, with Carlos Sainz claiming third and Francois Delecour finishing fifth. 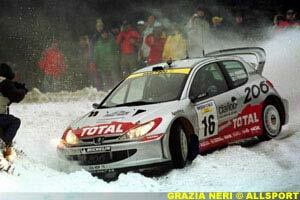 Colin McRae lost five minutes on the first day after getting stuck in a snow bank, but recovered to ninth, collecting important manufacturers' points for Ford. The privateer Peugeot of Gardemeister again scored well, coming home fourth, with the remaining point going to Subaru's Petter Solberg. Subaru's lead driver Richard Burns won all six stages of Leg 3, but after losing 13 minutes stuck in a snow bank in Leg 1, the effort mattered little. Markko Martin was also sufficiently delayed by excursions not to feature in the points. The underpowered Skodas didn't feature in the rally at all, while Hyundai continue to struggle with their first generation WRC car. Alister McRae and Kenneth Eriksson have shown promise in the old car however, and the forthcoming Hyundai Accent WRC2 should help considerably. In the manufacturers' title chase, Mitsubishi has built an early lead on 23 points, nine points clear of Ford on fourteen. Skoda is next with six points, ahead of Hyundai on five and Subaru on four, while Peugeot are yet to score a point. The third round of the championship starts in Portugal on March 8. The weekend following the Australian Grand Prix sees the first round of CART's World Series, the first to be held at Mexico's Monterrey Speedway. Leading team Chip Ganassi Racing front an all-new team after Juan Pablo Montoya and Jimmy Vasser headed elsewhere for 2001. Replacing them are Bruno Junqueira and Nicolas Minassian, the 2000 FIA F3000 champion and runner-up respectively. Team Penske are business as usual, staying with defending champion Gil de Ferran and Helio Castro-Neves. Backroom legend Mo Nunn continues with his fledgling team, and will have Formula One refugee Alex Zanardi and Tony Kanaan onboard. Team Kool Green continue with Dario Franchitti and Paul Tracy, while Jimmy Vasser has joined Roberto Moreno at Patrick Racing. At PacWest, Mauricio Gugelmin is joined by New Zealand sensation Scott Dixon, and Shinji Nakano joins Adrian Fernandez's new team. Newman-Haas have introduced Cristiano da Matta to regular Newman-Haas driver Christian Fittipaldi, while Forsythe Racing have kept last year's pairing of Alex Tagliani & Patrick Carpentier. Michael Andretti will drive for Team Motorola, a satellite team of Team Green, while Team Rahal, currently without team founder Jaguar Formula One boss Bobby Rahal, has Max Papis and Kenny Brack. Another sensational series looks in the offing for the series many people view as an alternative to Formula One. Peugeot Sport have added former factory Ford and Subaru driver Simon Jean-Joseph to their squad of drivers. Peugeot's team now includes reigning world champion Marcus Gronholm, former world champion Didier Auriol, Rally Sweden victor Harri Rovanpera, and the quick young driver, Gilles Panizzi. Hyundai's WRC program has been set back after an accident to the team's only second generation Accent WRC during testing in Spain. Luckily, driver Alister McRae and temporary navigator Ian Grindrod escaped unhurt from the accident. The South Australian state government announced last Friday that they had cancelled the Adelaide 'Le Mans' street race. South Australian Premier John Olsen said at a political luncheon that the funds were to be reallocated to the state's health system. The promoters, Panoz Motorsport Australia, were not consulted about the decision. Series promoter Don Panoz has since stated he was 'shocked and disappointed' by the decision. The street circuit which held the Australian Formula One Grand Prix from 1985 to 1995 will now only be used once a year for the Clipsal 500 touring car event in April. In other Australian news, speculation over the future of Rally Australia has been put on hold with the awarding of a three year deal for TV rights, keeping the event in Perth until 2003. The Melbourne Major Events Committee, whose stable of events includes the Australian Formula One Grand Prix, have been aggressively chasing the rally. Testing continues for the World Motorcycle Championship teams with official IRTA tests across the Iberian peninsula. The most recent test at Estoril in Portugal saw Max Biaggi (Yamaha) fastest with a 1:40.149 lap time, just ahead of Jurgen Vd Goorbergh's Proton KR3. Biaggi's Marlboro Yamaha teammate Carlos Checa was third fastest ahead of Red Bull Yamaha rider Garry McCoy. The fastest Honda was Alex Barros, on one of Sito Pons' bikes. There were numerous crashes during the test, including Suzuki's reigning world champion Kenny Roberts Jr. Daijiro Katoh (Honda) was fastest of the 250cc riders present, almost a second clear of Aprilia's Marco Melandri. However, Repsol Honda's Alex Criville took no part in the Estoril test after a fall at the Jerez IRTA test. Criville was on his seventh lap when he highsided approaching Angel Neito corner. Criville walked away from the accident, but the little finger on his left hand required medical attention. Criville had only just recovered from tendon surgery two months ago to the little finger of his right hand.